Pretty, little Salento. A coffee town with such irresistible charm the fact that it’s almost exclusively a tourist town doesn’t even matter. Colombians and foreigners alike come in flocks from nearby cities. Quiet weekdays mark the clam before the storm of people that arrive for a weekend getaway. 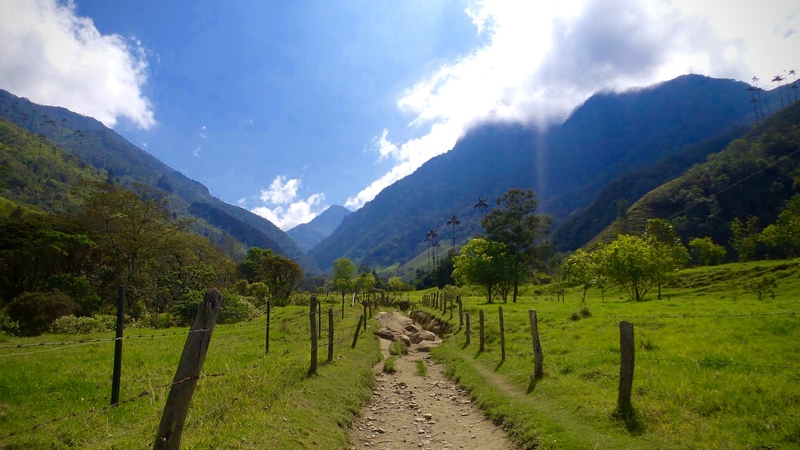 It’s a perfect base for short nature hikes through the famous Cocora Valley or more involved climbs to the top of staggering volcanos and surrounded by hot springs. I was sucked in and stuck to it’s magnetic pull. I could have stayed at least a month longer…or forever. At the edge of town, just about a thousand stairs lead to panoramic views of deep valleys and matching rooftops. The hundreds of people below wandering the handful of streets look like trapped, lost ants. At the top, a cheerful, jokester/mixologist/genius who put a makeshift mojito bar at the top of a hill, threw together carefully but not well crafted cocktails like they had the power to save lives. Who am I to argue? Outdoor seating in the square makes for the best place to enjoy cold beers and countless dining options. Trucha is the famous local dish, a river trout served whole with a slew of optional accoutrements. Every single restaurant and food stall claim to have the best. Teenagers chase and flirt, parents drink and relax, and children play games and ride what I can only explain as strange, shrunken, taxidermied-looking horses on wheels. They are mesmerizing as they circle like a disassembled merry-go-round. There are many places like Salento; cute, small and special, but there are times in travel when a place that would be exceptional on its own is transformed by connections and serendipitous moments, the things that really matter. With warm days and cool nights the surrounding mountains and coffee farms are enough for weeks worth of hiking and nature excursions making leaving Salento nearly impossible to begin with. Add to that the particular folks I met and perfectly timed situations and I was hooked. Salento felt as if it had all been staged, rehearsed, and awaiting my arrival. Each role perfectly cast; the handsome, rugged love interest, the ready for adventure-sidekick-best friend, and the fun, always up for a beer and a chat neighbor that brought us all together. All set in a hostel that felt like a home away from home with staff that act like friends instead of employees. It doesn’t take long to establish a routine, have your favorite restaurants, and start a rapport with a couple of locals. You find yourself giving recommendations to newcomers as if you’ve been there for years and know where to find the best of anything. A couple days effortlessly turned into a couple weeks. But like all good things and made for tv moments it must come to an end. When I left Salento I left a small piece of my heart but took away the kind of romanticized memories that can’t be found in guide books or on tours and can never be replicated or forced but define an intimate, personal experience with a place that makes it more special than can ever be explained. I almost never want to return for fear of altering those memories lived through rose colored glasses.